The Cougars prepare for a rising California defense when they host the Bears in Pullman on Saturday. The Washington State Cougars have stunned the country, to say the least, with their successful run through the 2018 season. The team that was picked to finish fifth in the Pac-12 rose up to the top of the standings and broke into the Associated Press' Top 10 following their 41-38 win over Stanford last week. Now the Cougs (7-1) prepare for another team that has been consistently dismissed by the Pac-12, until recently. 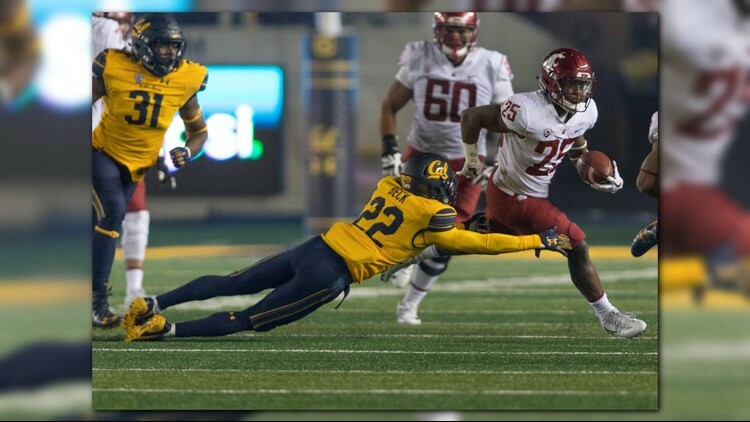 Next on WSU's docket is the California Golden Bears, who dropped their first three conference games this season. But in the last two weeks, the Bears -- especially their defense -- have managed to get noticed by the Pac-12. Cal's defense bailed out the Bears over and over again in their 12-10 upset win over then-No. 15 Washington last week, which included scoring an interception touchdown in the second quarter that put the Bears on top for good. The win was especially shocking for the Huskies because Washington was favored by 12 points heading into last week's contest. The victory bumped California's record to 5-3 and knocked Washington out of the AP Top 25 Poll. Cal's defense has not been consistent throughout the entire 2018 season, but as of the last two weeks, the Bears have found a rhythm in their defense that has caused some trouble in the Pac-12. The Bears limited Oregon State and the Huskies to a combined 17 points and allowed a combined 483 total yards on offense. The Bears' defense currently ranks 17th in the nation in yards allowed per game (312). After their performance against Washington, they jumped to eighth in the country in passing yards allowed per game (165.5). That being said, Cal has yet to face the Cougs' Air Raid offense this season with Gardner Minshew II leading the pack. Minshew's name finally entered the Heisman Trophy conversation following his comeback performance against Stanford on Oct. 27. The QB currently leads the NCAA with 3,183 yards in 2018. He also leads the nation in passing yards per game, with 397.9 yards across eight games. The entire WSU offense will be enough to put a kink in Cal's defense. The Cougs are averaging almost 41 points this season, which ranks 12th among NCAA teams. The Air Raid leads the NCAA in passing offense with a staggering 405.6 yards per game and as of Tuesday, the Cougs are second in the nation in fourth-down conversions with a 84.2 percent success rate. WSU hosts the Bears at Martin Stadium on Saturday at 7:45 p.m.
Redshirt freshman Chase Garbers and redshirt sophomore Brandon McIlwain have shared the role at quarterback in the 2018 season. Both have struggled to put up reasonable numbers and relied on their defense to pull them up. Garbers has averaged 147 yards in six games played this season and has passed four interceptions. McIlwain has averaged just 89 yards and has seven interceptions, all in Pac-12 play. At the end of October, the Bears are averaging less than 25 points in eight games, even with their season high 49 points against the Beavers on Oct. 20. Cal's victory over Washington last week was the team's first win over a ranked team since 2017 when the Bears stunned the then-No. 8 WSU 37-3. In that game, it was the Bears' defense that once again shut down then-QB Luke Falk and the entire WSU offense. Cal held the Cougs to just one field goal in the second quarter under the guidance of first-year head coach Justin Wilcox. Falk tossed five interceptions after throwing just two interceptions in roughly 260 passes. The Bears forced the Cougs' offense to seven total turnovers that night and sacked Falk nine times. It was Cal's first time beating a Top-10 team in 14 years.